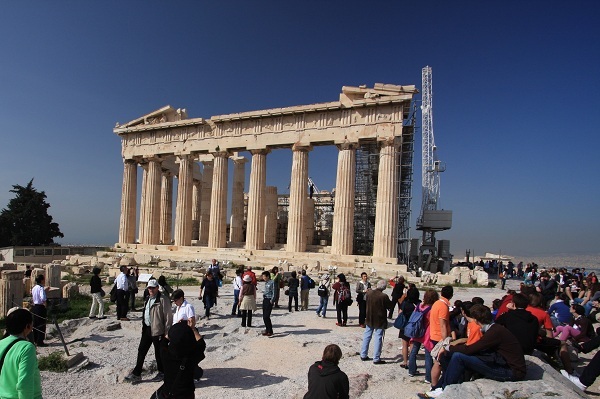 After seeing the Acropolis in Athens on March 22, 2010, we went to some sites of hellebores with our guide, a very famous botanist in Greece. The first site was on the mountain of Helikon at an altitude of about 700 meters. We could see H.cyclophyllus, which had already gone to seed due to the warm weather this year, here and there. Although I know hellebores were used to cure heart disease, etc., they are still used as heart and mental disease medications, and also used as a preventive medicine for lambs, according to our guide. On March 23rd, we saw the same species, H. cyclophyllus on Pelion Mountain. But, unfortunately, we happened to come across the same situation as the previous day because almost all of them had gone to seed. He said that H. cyclophyllus was not a rare plant as it had spread all over Greece, except Crete Island. 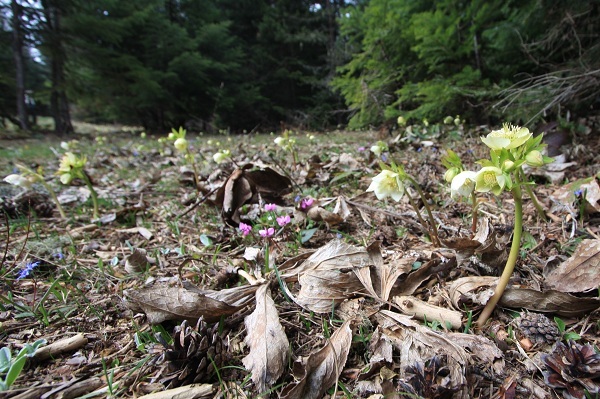 Unfortunately, the hellebores there were as bad as we had expected. 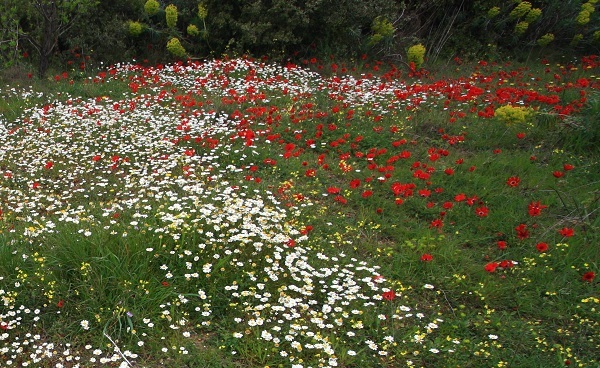 But we had the opportunity to see Anemone, Euphorbia and Anthemis at a lower altitude of the same mountain. That was a really fantastic place, and we were very satisfied with the scenery. On March 25th, we flew to Istanbul in Turkey. 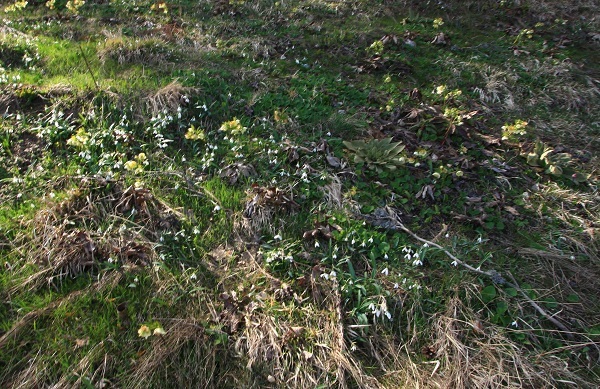 A young Turkish man, whose major was botany at Istanbul University, took us to some sites of hellebores. There was a site of H.orientalis subsp. 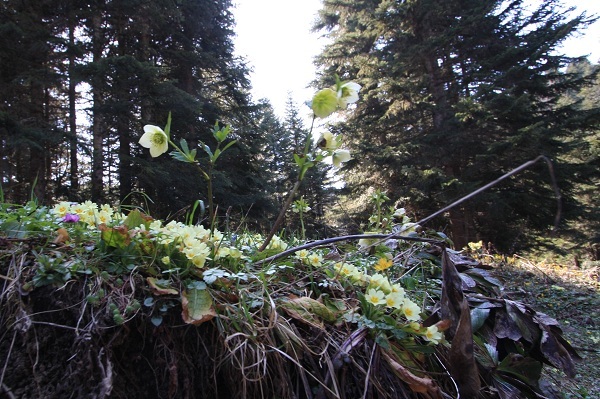 orientalis-where flowering Primula vulgaris subsp. 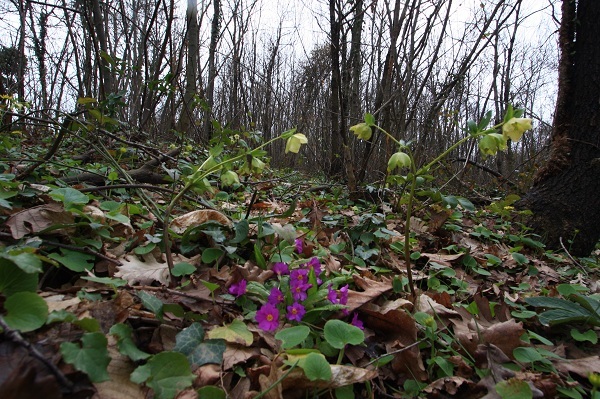 sibthorpii, which we had never seen in the Balkans, was also growing -near the road in Belgrade Forest. 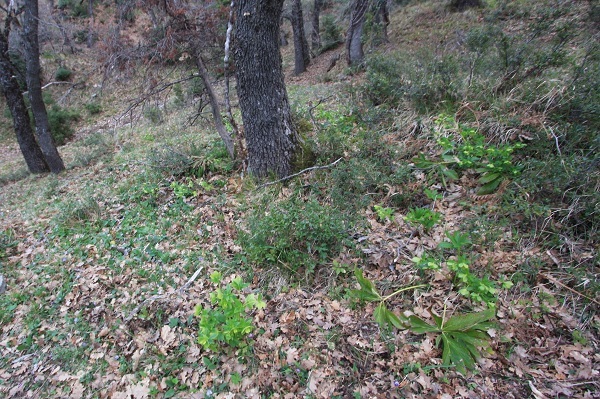 It was very difficult for us to climb the steep slope in bush where there were a lot of creeping plants. The other members gave up climbing to the top, so only I was able to see this wonderful sight. On March 26th, we moved, by coach, to Abant near Bolu(about 250 kilometers east of Istanbul). On the way to the site, we enjoyed fried trout for lunch at a local restaurant. We could see some hellebores around the restaurant. Then we reached the hellebore site. This was at an altitude of about 1,300 meters near a lake that he recommended. It was so different from what we had expected. 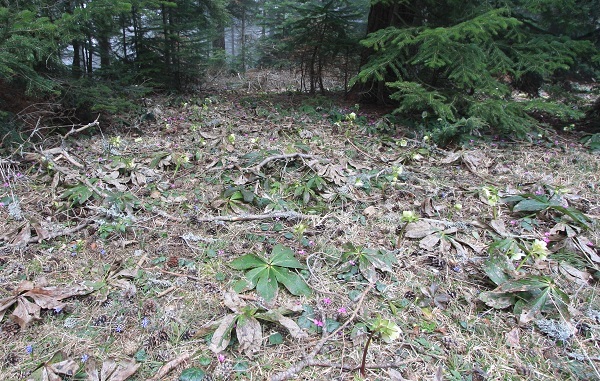 Namely, the hellebores at the site were growing under needle trees in open areas, not under deciduous ones. We had usually seen them under deciduous trees in the Balkans. That surprised me so much because I had never seen such a strange sight as this. I realized everything has an exception. 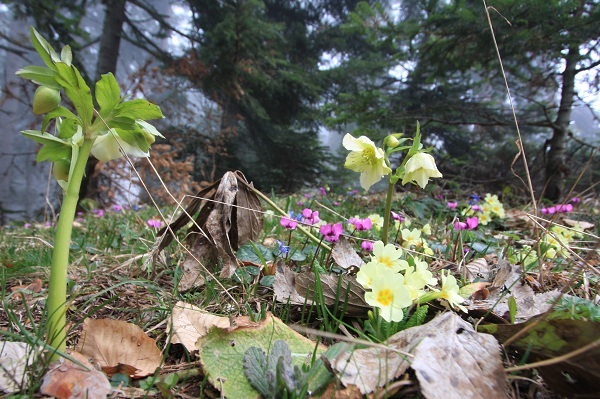 We found a fantastic place in the fog where we could see a lot of flowers such as Primula vulgaris, Cyclamen coum, Crocus olivierii, Scilla bifolia and Erantis hyemalis together with H. orientalis subsp. orientalis. This wonderful scenery made me feel something mysterious and yet so happy. Forgetting all about the time, I took so many photos there. 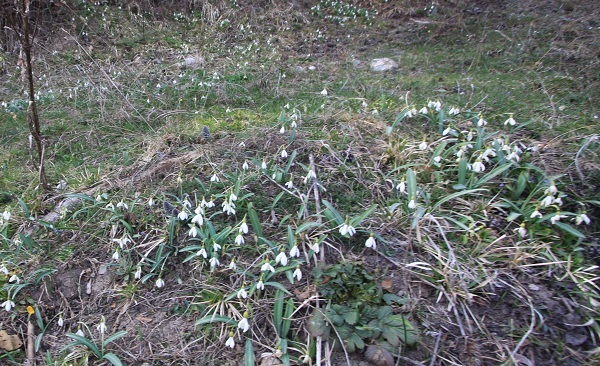 On the way back to Istanbul, we had a little time to take photos of Galanthus plicatus subsp. 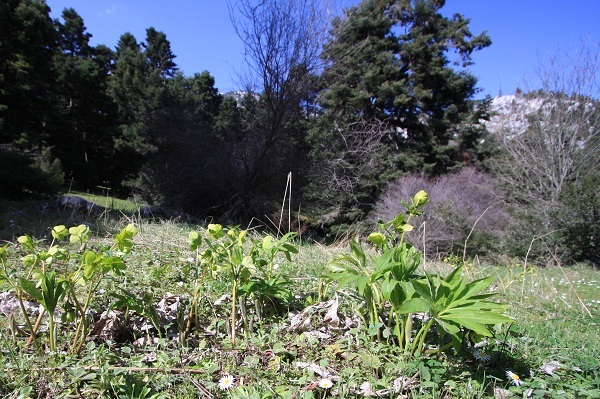 byzantinus, an endemic species in Turkey, with flowering hellebores on a hill. I felt quite strongly that this tour was great for flower lovers like us.